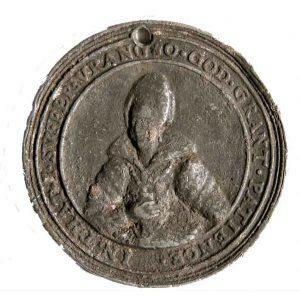 This sad token of the short life of Lady Arabella Stuart is a ‘protest portrait’ and is one of the hundreds of pewter pieces in the Stirling Smith collections. Arabella was an English noblewoman of Scottish descent, a great-great-granddaughter of Henry VII of England and considered as an heir to the English throne of Elizabeth I, before her cousin King James VI of Scotland was given preference by Elizabeth’s ministers. Her very existence was thought by King James to be a danger, and any marriage was an additional threat to his safety. Her marriage to William Seymour who himself had a claim to the throne led to her arrest and imprisonment in the Tower of London. She died there five years later from malnutrition, at the age of 40. 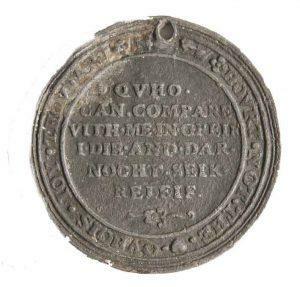 The medal is inscribed ‘O God grant patience and perseverance’ and in Scots ‘Who can compare with me in grief? I die and dare not seek relief’ with an image of Arabella, recognisable from portraits in other collections. Arabella was a highly educated woman who left over a hundred letters and who was reputedly tutored by Christopher Marlowe. There were many who were sympathetic to her plight, but unwilling or unable to do anything about it.